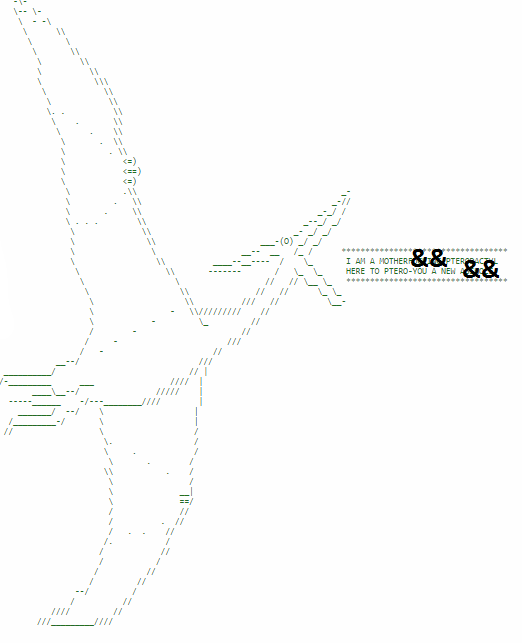 What you are looking at is the source code of the page that you are viewing. This information tells the browser how to display texts, images, etc. on your screen. 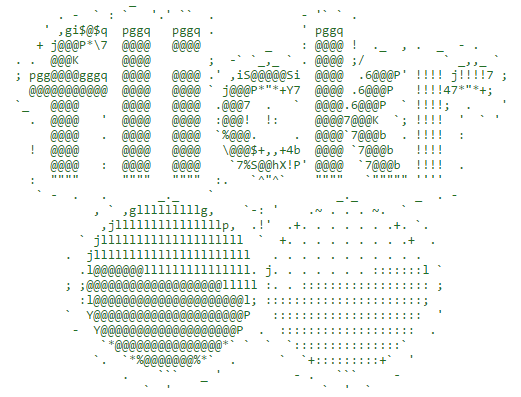 Flickr has been using this image to attract not only the attention of source code snoopers, but they also use it as a way to link to their job openings page. Mashable, the popular technology and social media trending tracking site, has a nice image of their own. Carly Fiorina’s name has been hijacked. The sheep above is called the “Demon Sheep”. I am guessing that is the webmaster’s name for Mrs. Fiorina. This hijack appears to have been done by disgruntled former employee(s) who may have been fired by her when she was the CEO of technology giant, HP. Mrs. Fiorina is currently campaigning to become the Republican nominee for the 2016 elections. Important lesson here, if you are planning to run for office, buy your name. This site has amazing art for its visitors. However, if you look behind the “curtain” there is even more art. Caution, this site has explicit language (NSFW). The popular blogging platform, Tumblr is among the favorite destination for photo-bloggers and teenagers. Interestingly, Tumblr was recently acquired by Yahoo. Yahoo is the company that now owns both Flickr and Tumblr. Could it be that Yahoo hates the letter “e”? Fresno High School Students walked out of school in support of their principal, Sylvia Palacios, who was demoted. They claim that the principal was removed from her post for standing up for the school. Allegations have been swirling about the reasons behind her firing as principal of the school. Fresno Independent School District Superintendent, Dr. Jeremy Lyon, implored the students not to march off campus. However, the students did so anyway on Tuesday. This technology tip is a great way to use technology in the classroom. 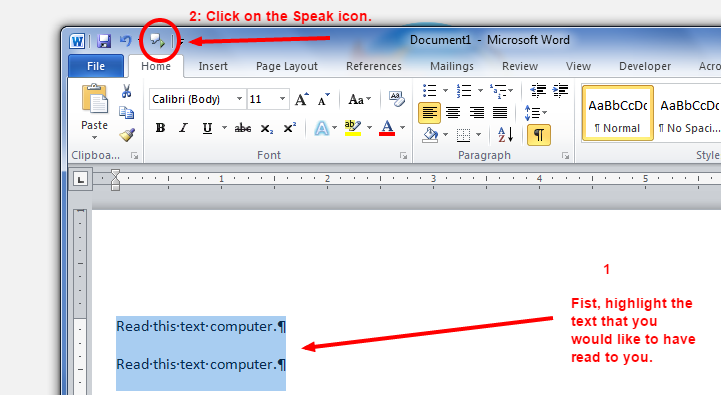 If you already have Microsoft Word running on your machine, this can be achieved by clicking on a few buttons. This should also work for Outlook, PowerPoint, and OneNote. a- Select the text that you would like to have narrated. 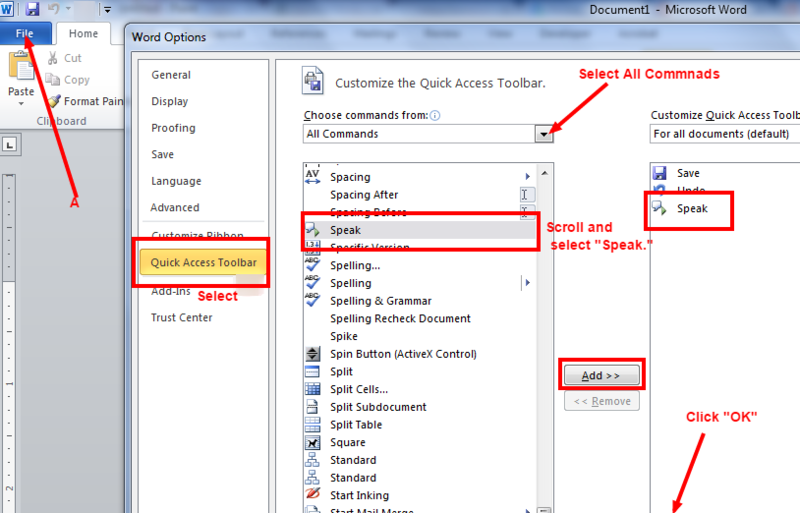 You will now see the Speak icon appear on your Quick Access Toolbar. You can access the Quick Access Toolbar menu using a shortcut method. This is a great tip to use in your classroom. Have your students type their papers, and when it is time to edit their papers, they can listen to their own writings. Uniform Resource Locators (URLs) posted online are usually posted in two ways: in their raw format or in a shortened format. The raw format usually looks something like https://www.twitter.com. The shortened, or obfuscated, format can be shortened based on the service that is being utilized to shorten the URLs. Twitter uses their own service called t.co to shorten their URLs. Facebook uses fb.me to shorten their URLs. You get the point. With the shortened format, users may be in the dark about where URLs are actually pointed. This can lead to users being directed to sites where software may end up being installed on their computers or other electronic devices. This is where Long URL comes in very handy. Long URL does not actually make URLs longer. Instead, the software lets you preview the raw format of URLs. This allows you to retain a certain level of security. You now know exactly where the link is pointing. If you are not sure about a particular link, do not click on it. You may end up regretting making such a decision. This is especially true of links shared on bookmarking sites or through your harmless email service. Long Url makes it very easy. You just copy the shortened email, visit their website and paste the shortened email. Thier service when them provide you the actual raw link in a snap. Identify potentially malicious sites before visiting them using services such as Long URL. 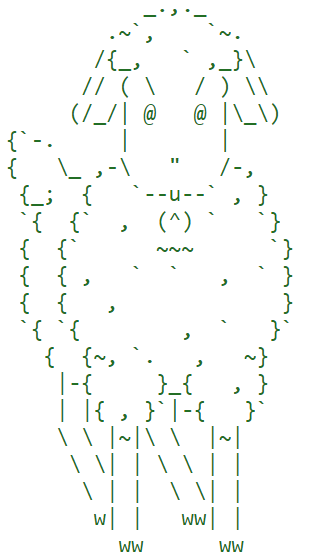 LongURL has an API. Therefore, other developers can use Long URL's service to provide transparency to readers. There are browser extensions that utilizes LongURL. Therefore, you will be able to see the real URL of a site without a need to access LongURL directly. A long list of url shortening sites are supported (go here to see the over 300 services supported). I cannot think of a single negative to such a great application. LongURL is a "simply great" service. Does what it it designed to do, and it works like a charm. It is always a good practice to not visit URLs that are unfamiliar to you. TinyURL and other like services solved a problem brought on by the advent of micro-blogging—limited message length. They do this by taking (sometimes incredibly long) URLs and creating a small compact one that redirects to the original. Solving one problem, though, created another one: obfuscation. 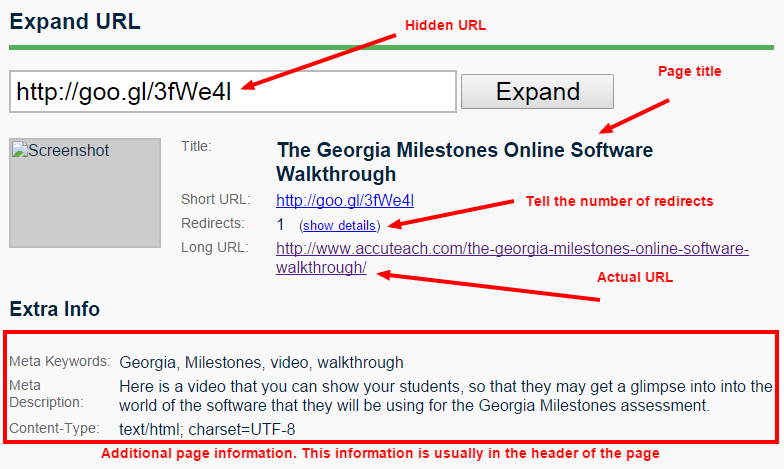 There's no way to tell (for sure) where a shortened link goes by just looking at it. So, then, I could send you this link http://is.gd/2kz and tell you to check out the photos from my recent trip, when in fact I'm sending you to a video of Rick Astley singing "Never Gonna Give You Up". This is bad for users. Summary: Microsoft Office 2013 is a slimmed-down version of the Office Suite of software that we are accustomed to seeing. However, there are a few features that the modern user may find appealing, such as the ability to easily take screenshots and insert video files into Office documents. Also, with added integration of Microsoft ObeDrive, you can easily share files, thus improving collaboration and portability. Microsoft Office 2013 is the new and improved version of Microsoft Office. Office 2013 works, or synchronizes, with Microsoft’s One Drive. One Drive is basically Microsoft’s attempt to stave off competition from Google and their continued approach towards more cloud-based offerings. Therefore, think about OneDrive as Microsoft's answer to Google Drive. By signing in to OneDrive using your Microsoft account credentials, instantly you will have access to your files in the cloud. Therefore, you can access your files across multiple devices and platforms. Microsoft Office comes packaged with Microsoft Office, Publisher, and OneNote. According to Microsoft, with OneDrive: get to your Office documents anywhere, share with anyone who has OneDrive, and access Microsoft's suite of products that includes Excel Online, OneNote 2013 Online, Word Online, and PowerPoint Online. You can now create word clouds directly from highlighted texts in Microsoft Word. This is HUGE; who does not like word clouds? They are immensely popular right now. You can add the applications that you need by simply clicking insert and selecting the apps that you would like to use. Currently, there is not a large selection of applications. However, there are free, and a few premium, applications. Microsoft still is a long way away from where established players in the app business are, such as Google. There are now more dynamic media options such as screenshots and video files. Screenshots can be inserted directly into Office programs from browser windows that are currently open. You can now insert videos and pictures from Bing and Google's YouTube video services, as well as other sites, via their videos' embed codes. You may have heard in the news that clipart is dead. There is still access to clipart, but it is no longer front and center. Images can also be inserted from Facebook and Flickr. You can even insert other documents into Word and other Office files. One cannot help but realize how similar all of the applications are. This makes it a lot easier for users to master the Microsoft Office Suite of applications. In addition, you will realize that the online version is just a slimmed down version of the desktop application with some of the awesomeness reserved for the desktop versions. It makes sense for Microsoft to do that. They have to create an incentive for users to buy the desktop version. The upgrades are great, however, for the added cost of upgrade, I am not sure whether or not it is worth the price. If you already have Office installed on your computer, I would not suggest that you make the investment. I think that it is a big mistake that Microsoft does not allow users to sign into OneDrive using email and social media accounts that they already own. Instead, you have to sign up for a Microsoft email based address to gain access to OneDrive. You may have noticed that most software publishers are moving towards a monthly price model. Microsoft is not fully there as yet, but they are slowly weaning us in that direction. However, with the current license structure you are limited to one license per device. This has caused Microsoft to receive a lot of flack from users. As a result, Microsoft had to issue an update to terms and service of Office 2013. Let's face it: Microsoft has a lot of competition. Therefore, they need to create more compelling reasons for users to want to upgrade. More and more people are being exposed to free alternatives to Microsoft Office, such as OpenOffice, Libre Office, Google, and the list goes on and on. Microsoft Office 2013 is amazing! There is nothing out there right now that improves the efficiency that is available here in a single interface. However, if you have a previous version of Office, you may be in for a little disappointment. With SlideDog, presentations do not have to be complicated. Summary: SlideDog is an interactive presentation software player that allows you the ability to seamlessly combine all your presentation files into a single software interface. Basically, it's a simple way to bring all of your presentation files together nicely. Do you frequently deliver presentations that involve video from YouTube, Prezi Presentations, and texts from PDF files? Do you find yourself switching between them, causing your presentations to seem choppy and potentially discombobulated? Well, SlideDog is for you. SlideDog allows for the seamless combination of files into a single presentation-player interface that is very easy to use. This makes SlideDog a great way to optimize the use of technology in the classroom and will make your corporate presentations more engaging and smooth. SlideDog has a very simple and fluid interface that makes it very easy for the average user to get up and running in no-time. No matter whom your audience is, students, clients or even family, the main objective of your presentation is to get your message across. Therefore, SlideDog takes the fiddles out of your presentations and makes it sleekly smooth. There is no better way to keep your audience engaged than to get them actually involved in the presentations. Do not just put on a show, get your audience in the moment. You can add elements such as polls, feedback and chat interactives directly into your presentations via a sharable link from a simple interface, providing useful user analytics. You can control your presentation slides with your mobile phone. Therefore, you do not have to buy additional presentation software; you can just use the web-remote (cellphone) to move between slides flawlessly. With presentations lasting 15 minutes or less, you will have access to pro features. You can import a wide array of files and interactive items into SlideDog such as PDF files, PowerPoint, Prezi, video and YouTube videos. If you are running out of time and want to get to a specific slide within your presentation, you can quickly and easily slide to that file to make sure that you present it to your audience. By default, SlideDog is set to share your usage information of the software. I do not think that this is a major issue, however, I think that behavior should not be the default setting. Instead, maybe they should have a prompt that asks the user to opt in to sharing usage data. $ 99 per year (45% discount). SlideDog is only good for Windows-based operating systems. Some of the interactive features of SlideDog require internet access. How about WiFi compatibility? Having this features will allow SlideDog to go up against some big players in the interactive presentation business. SlideDog is a multimedia presentation tool that allows you to create presentation playlists by combining different file and media types. You can seamlessly blend multiple PowerPoint decks, PDF documents, websites, Prezis, images and movies together in a single presentation without having to stop the flow of your speech to bring up your next item on the screen. The result is smoother presentation that breaks free of the limits of utilizing a single platform for delivering your presentation. The basic version is free, and an upgraded Pro version will cost you $99 for the year which includes additional functionality like dual-screen support and an option to add your custom background. SlideDog is tailored for use on dual displays and features a separate presenter screen with your playlist, timer and notes while the audience only sees your slides. SlideDog is targeted at educators, sales persons, AV technicians, professional presenters and users who hold presentations as part of their daily work or education. I think that SlideDog does what it promises: Povides a simple, but powerful presentation player that adds interactive features to your aggregated presentation files. This will make your presentations flow seamlessly without the need to switch between files on your computer. Give SlideDog a spin and let us know what you think.